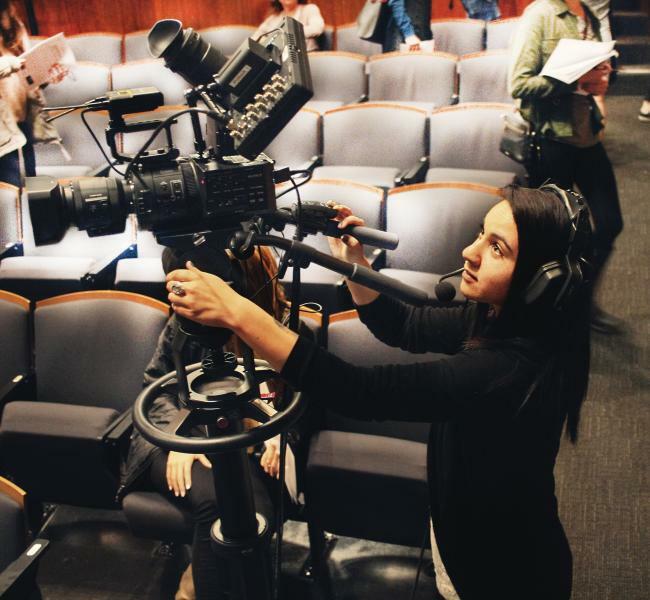 The Pollock Theater Internship is a selective program offering industry-level hands-on experience in live television production and event planning. Over the course of the three quarter internship, students will focus on learning how to write Q&As with an emphasis on shooting and directing Q&As in fall, narrative in winter, and sitcoms in spring. Interns also work night events where they will shoot live, multi-camera Q&As which air on the UCTV broadcast cable station and provide them with production credentials. The TV shows produced through this program have generated 15.1 million views on UCTV. Fall 2019 Applications are due Friday, April 26 at 5pm. Using industry standard broadcast and production equipment, interns are provided with the important skills and production credits to make the transition into the television industry. Some of our shows have included Get Out with Oscar® winning filmmaker Jordan Peele, Game of Thrones with Emmy® nominated director Jeremy Podeswa, The Big Sick with Oscar® nominated screenwriters Emily V. Gordon and Kumail Nanjiani, and VEEP with actress Julia Louis-Dreyfus, actor Tony Hale, and writer/executive producer David Mandel. For the Fall 2019 quarter, Pollock Theater interns will meet weekly on Fridays, 1:00pm-4:30pm and an additional eight evening/weekend events during the quarter. Interns are eligible to take the course for three quarters at 2 units each, and preference is given to students intending to complete all three quarter segments. Interns must meet a certain performance standard to be invited back for additional quarters. Eligibility: No production experience is necessary. Applicants should have a strong desire to acquire hands-on production and event-planning experience.